4-blade, 36" Honda GX270, 8.5 HP,90-155 RPM blade speed. 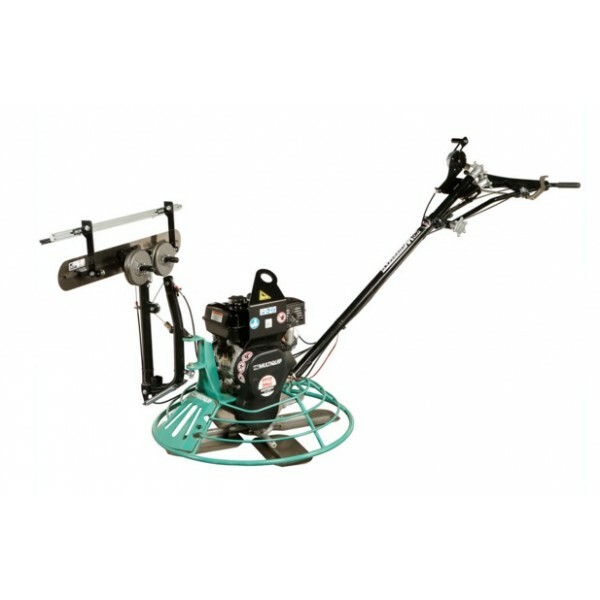 Unique design, featuring an integrated boom enables application of a broom or fresno finish during the final trowel pass. It is ideally suited for parking structures, multi-story projects and jobs that do not require a burnished surface. Heavy-Duty Walk-behind trowel gearbox and CVT drive. Easy to service spider assembly reduces cost of ownership. Honda GX270 offers top rotor speed of 155-RPM for high speed burnishing. Reduces the amount of labor and time required to complete the job. Mechanical boom has 180° range of lateral motion. Advanced friction clutch stops the unit within a quarter of a turn if the operator releases the handle at full RPM. Proven gearboxes deliver years of trouble-free operation. 4-blade spider features economically replaceable wear parts that reduce maintenance costs over the life of the machine. Variable blade pitch adjustment uses a standard knob-type control. Clutch Type Friction type clutch system. PRO464-blade,46" Honda GX340,10.7 HP,60-130 RPM blade speed.MQ Whiteman Pro Trowel, available in 36”..